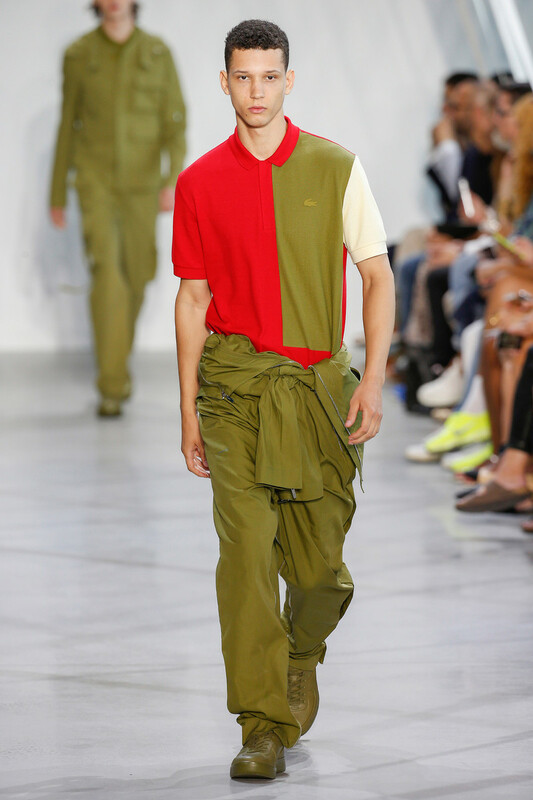 Although best known for it’s croc embroidery Lacoste is approaching it’s branding differently for SS2016. 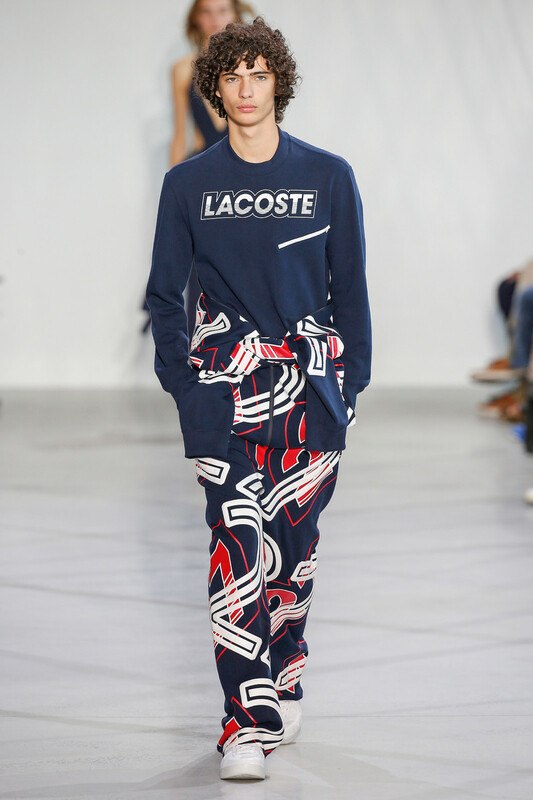 For instance with ‘Lacoste’ printed on a navy two piece worn by Lineisy Montero or on a hooded dress worn by Harleth Kuusik and ‘Rene’ (referring to founder and tennis champion René Lacoste) printed on a menswear polo. 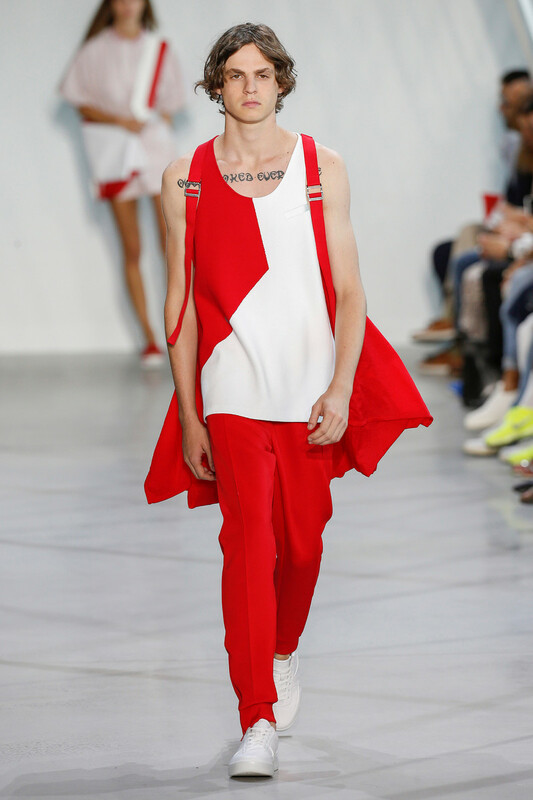 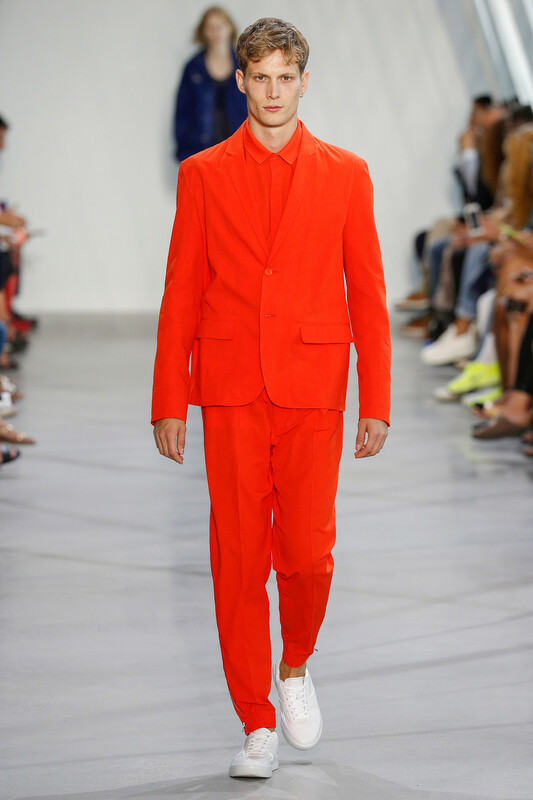 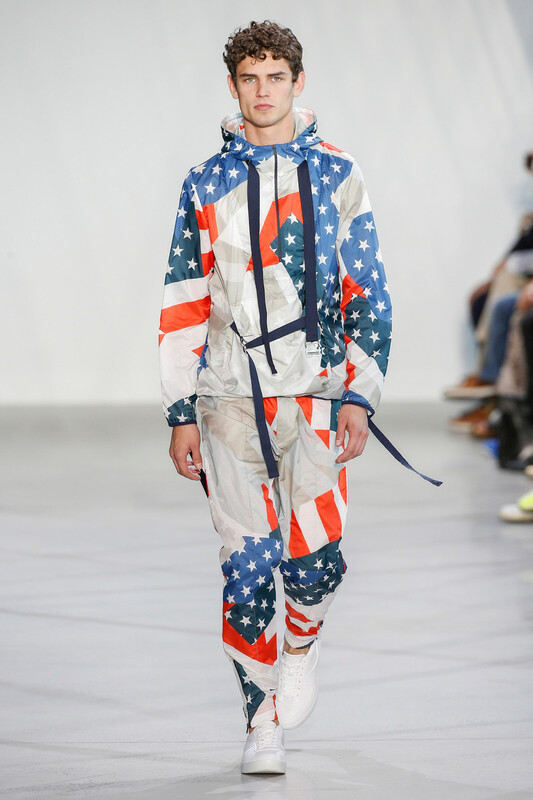 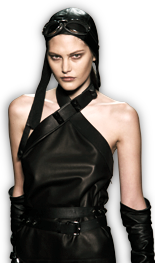 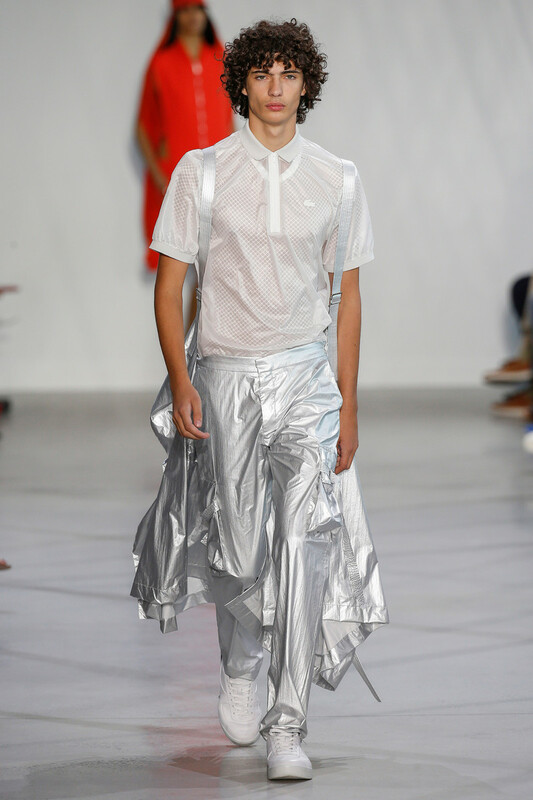 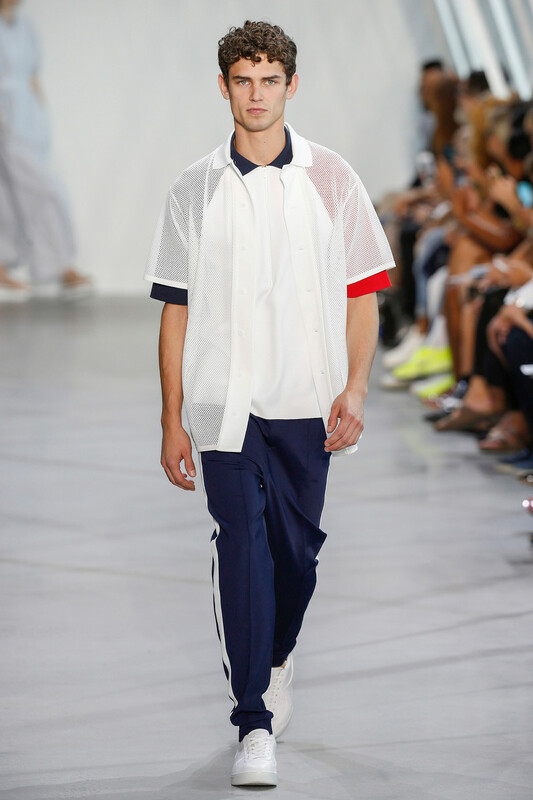 But also by turning it’s sportswear up a notch. 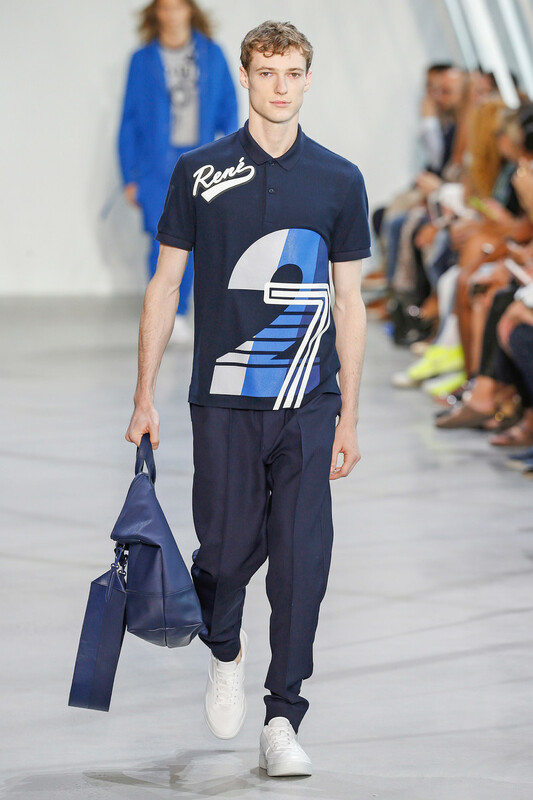 Leaving the classic polo shirt aside and focusing on new shapes and silhouettes. 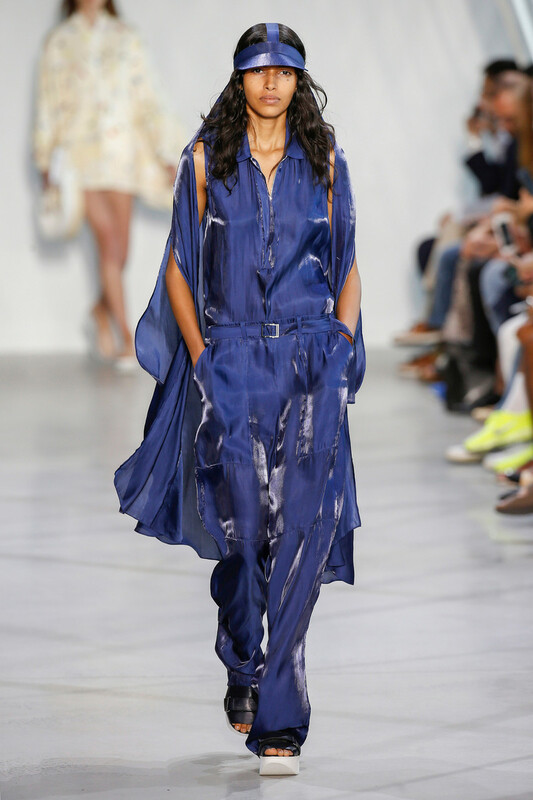 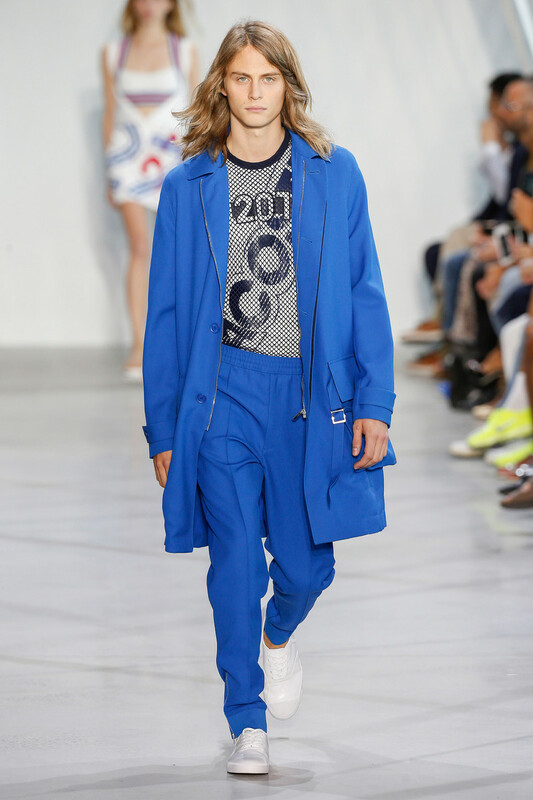 Like an elegant blue number sported by Maartje Verhoef that seemed a mix of both a bathing suit and a legging. 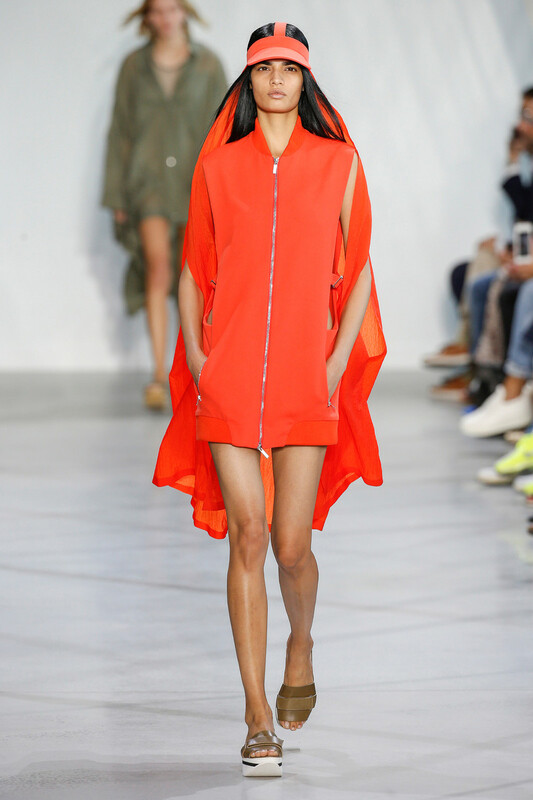 Or a vibrant red zipped dress and matching cap Bhumika Arora pulled off perfectly. 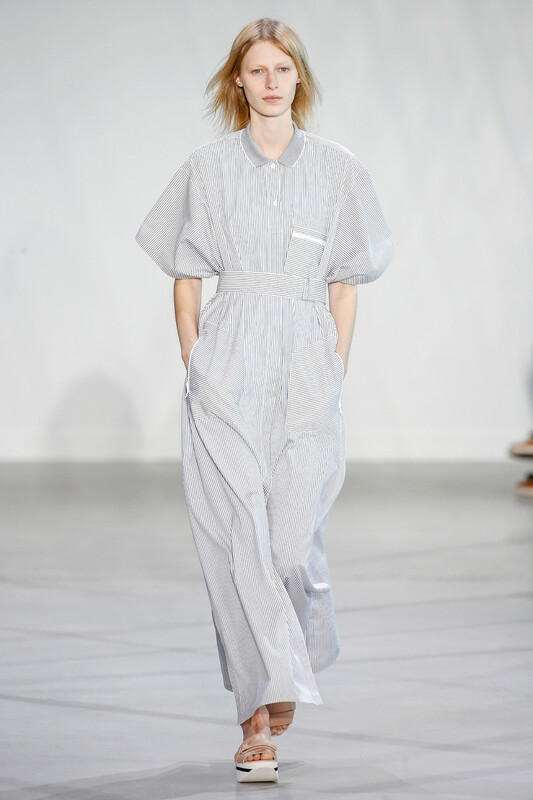 But the fresh touch was also in those roomy jumpsuits, short bomber jackets and belted blouses. 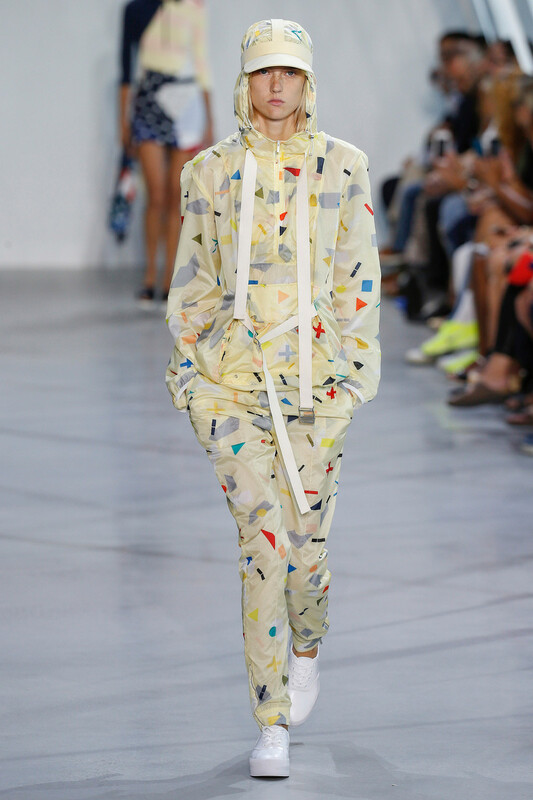 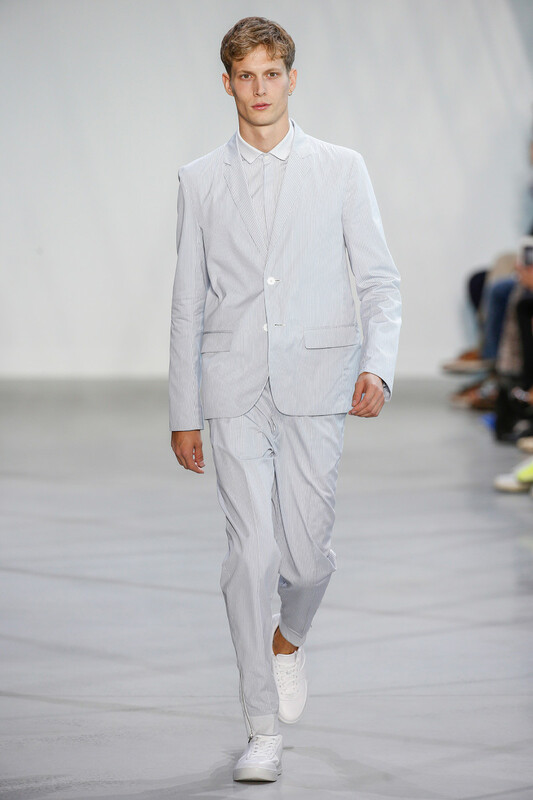 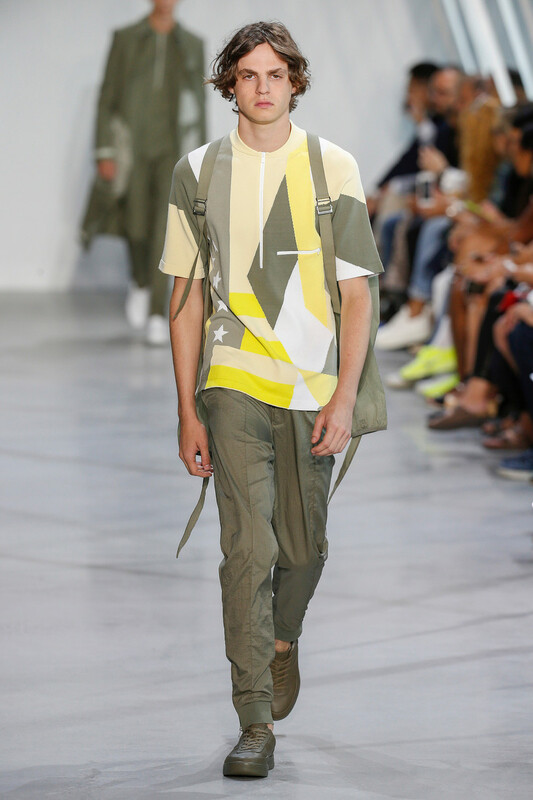 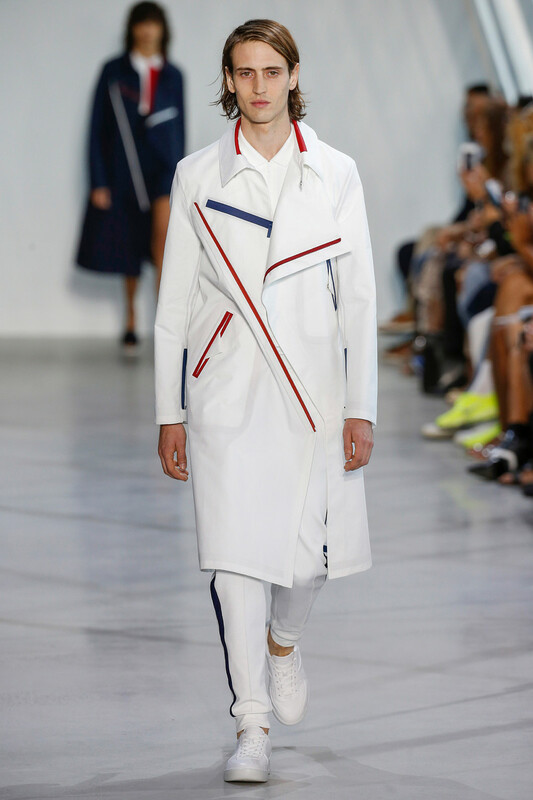 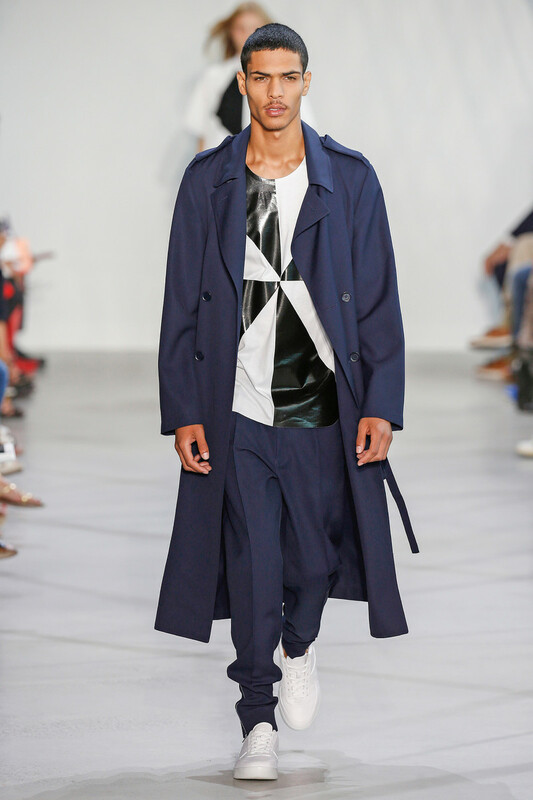 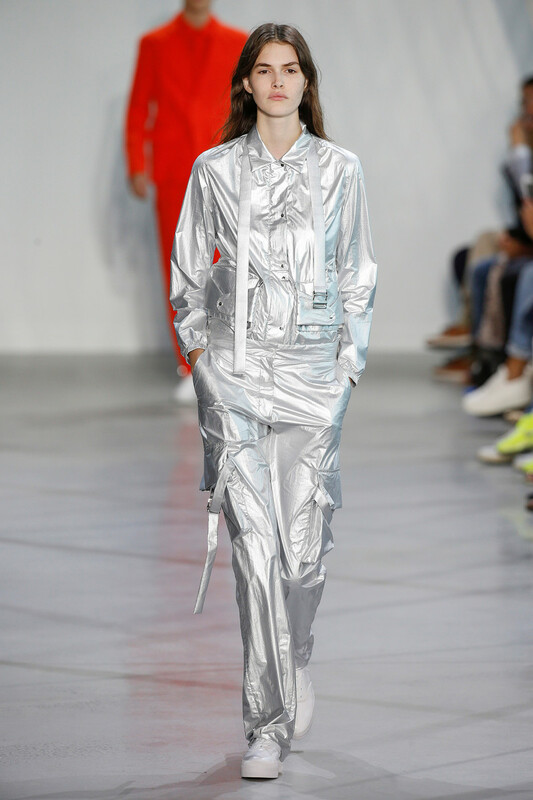 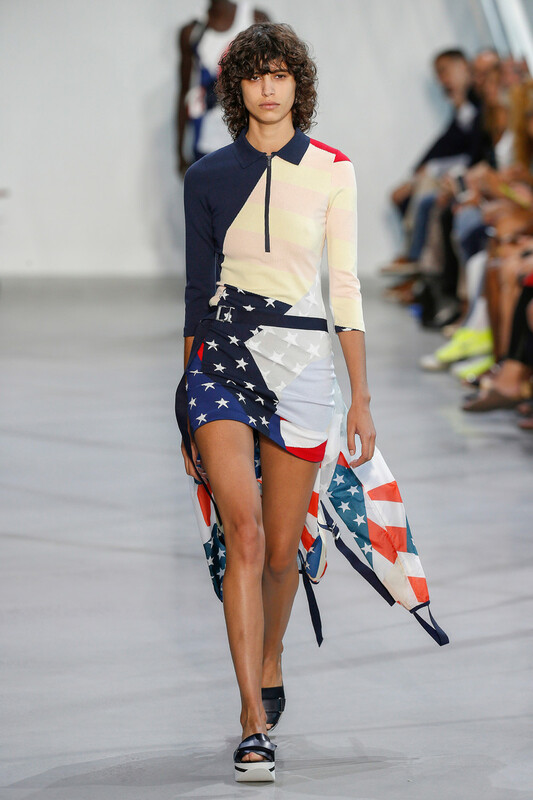 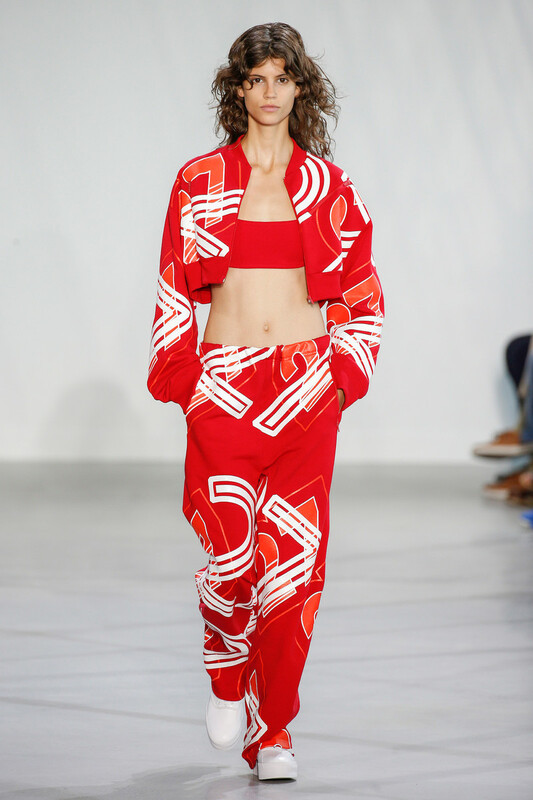 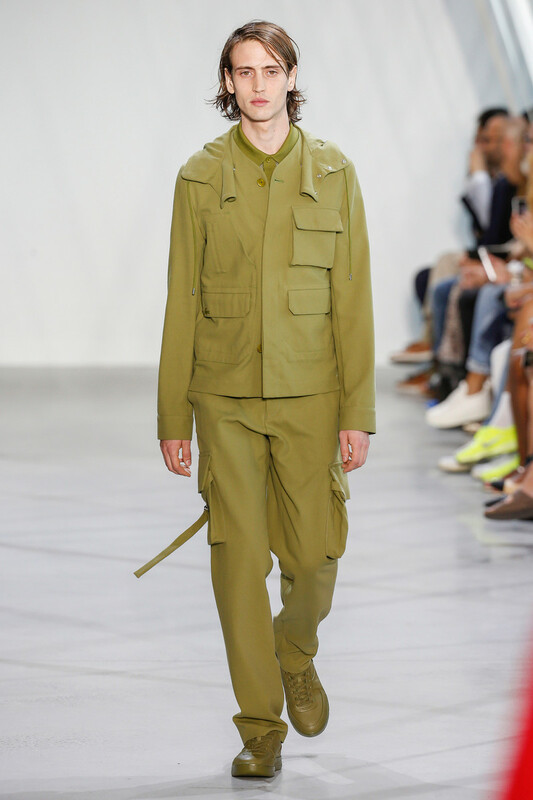 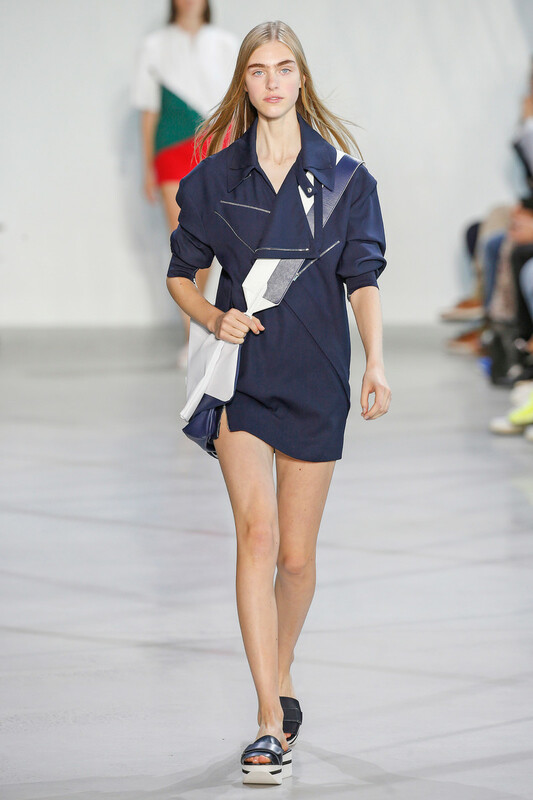 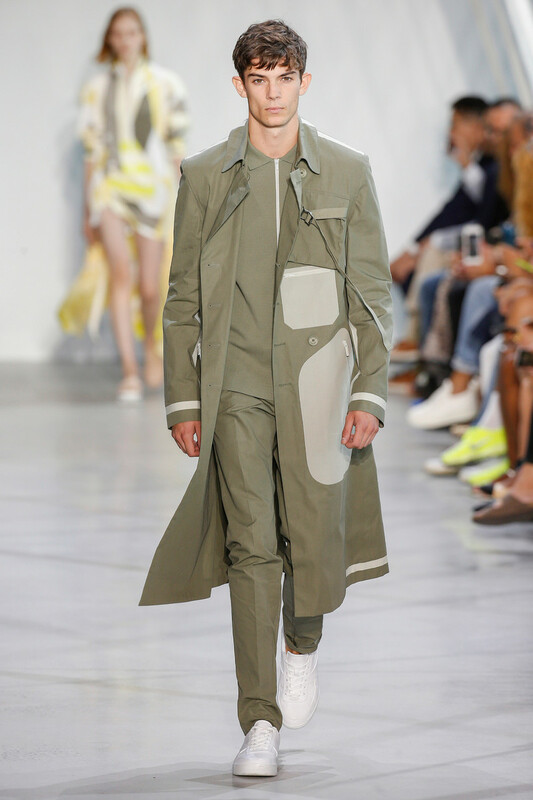 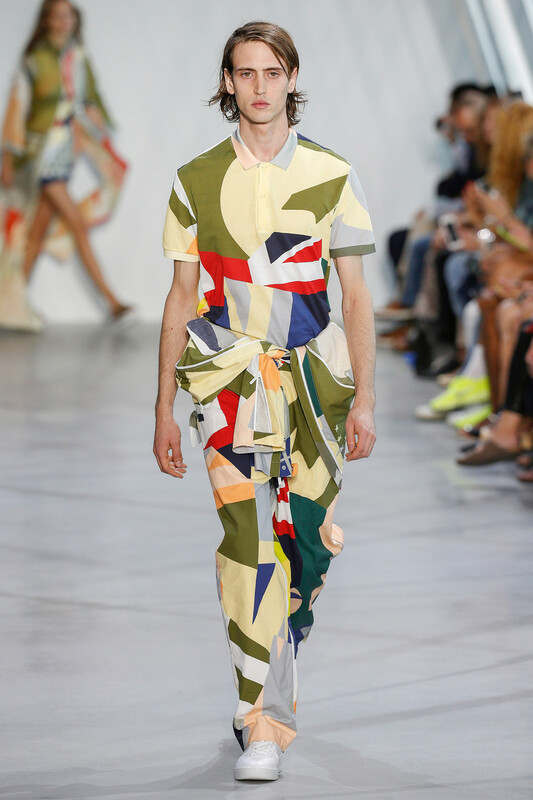 Sportswear pieces given a little twist by designer Felipe Oliveira Baptista. 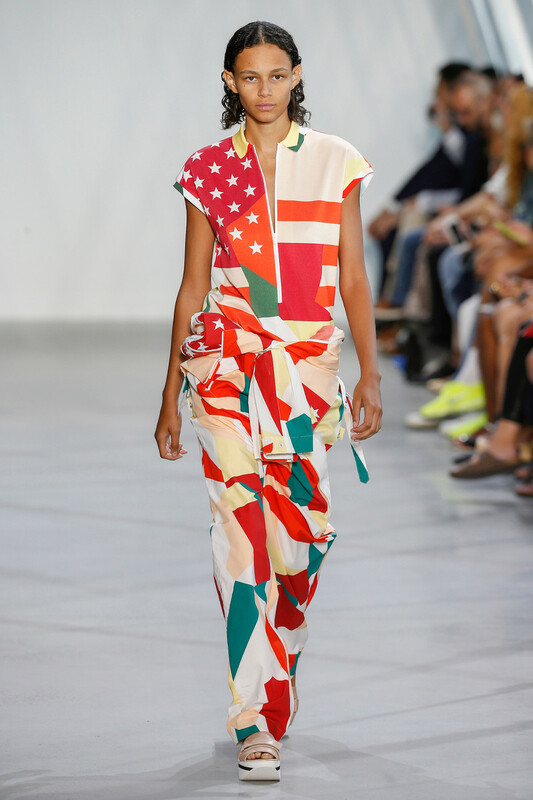 Not to mention the way the creative used the flags of so many countries as eye catching prints. 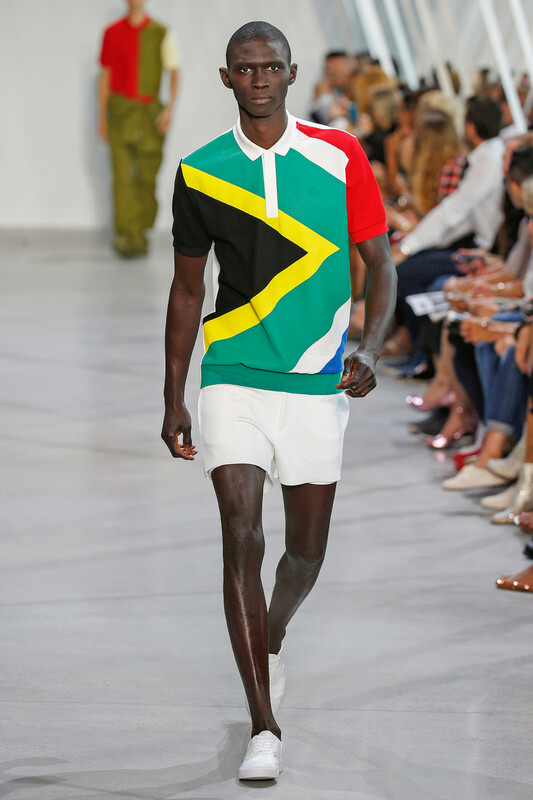 Cuts dictated by the geometry of banners – lines, triangles, lozenges, the horizontal Y of South Africa. 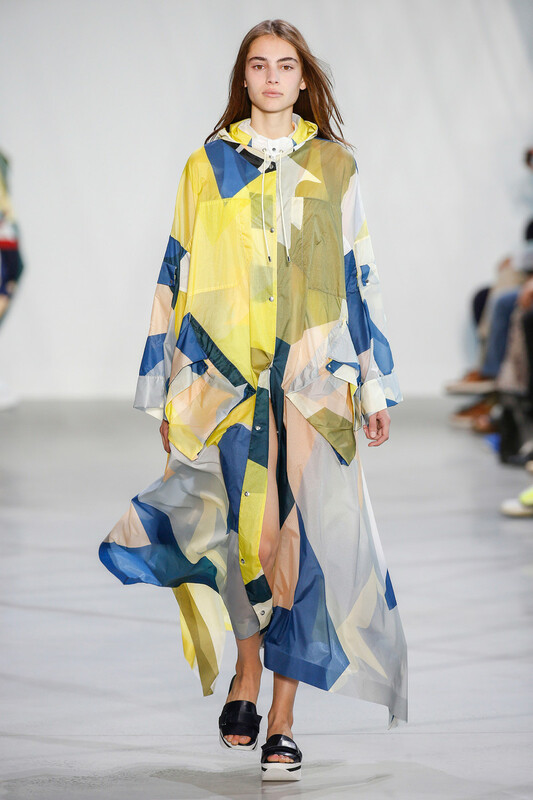 Primary colors – the blue, white and red shared by the flags of France, USA, England and Russia – but also the yellow and sky blue of Sweden, resonate in the collection’s color palette. 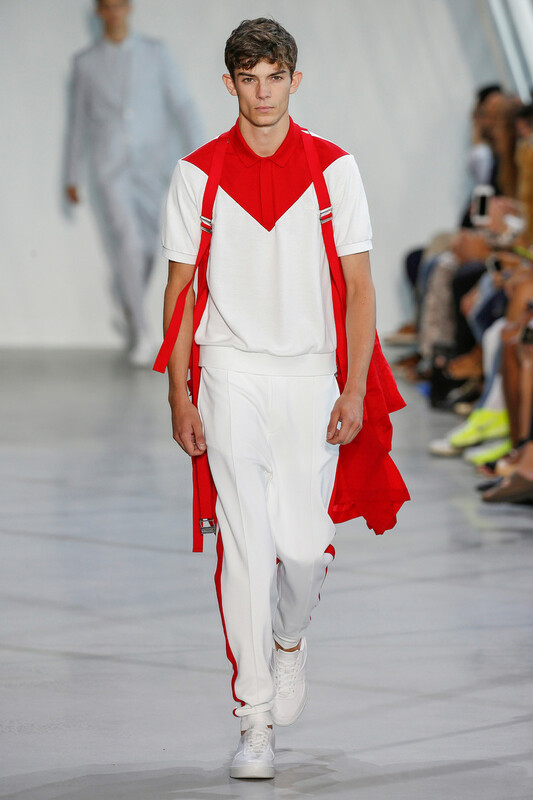 A nod to the Olympics in Rio next summer, for which Lacoste may again dress the French team. 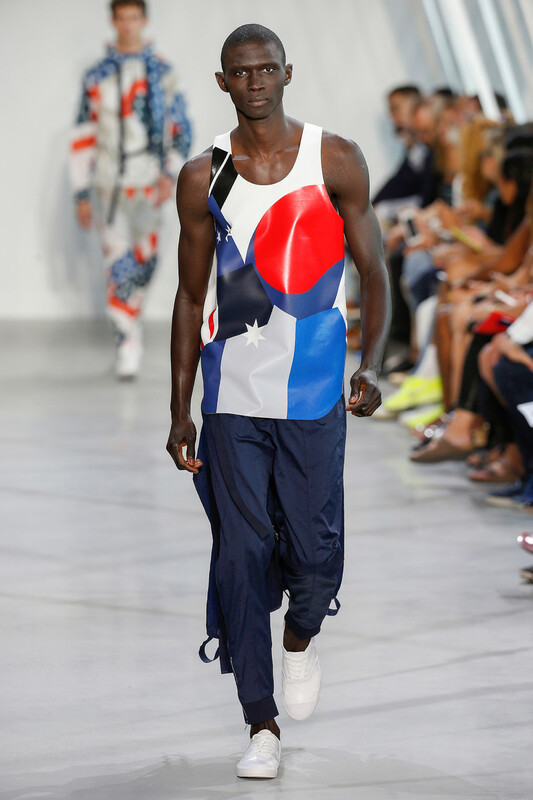 An honor you don’t just go by in your ready to wear collection and an ultimate opportunity to send out a message of diversity.